» Downtown library hours: Saturdays! 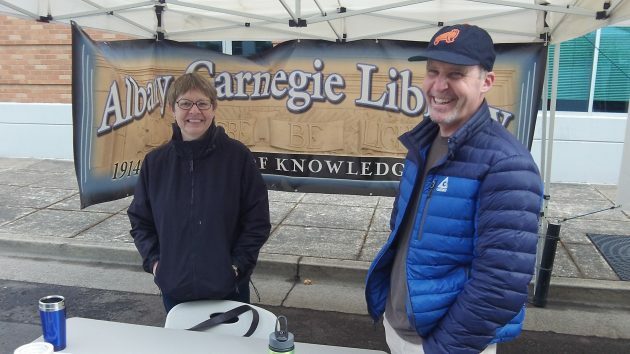 Rosemary Bennett and Mark Spence promote the downtown library at the farmers’ market Saturday. I learned about this Saturday at the farmers’ market, where Rosemary Bennett and Mark Spence of the Albany Public Library Foundation had a table and were handing out — what else? — bookmarks. 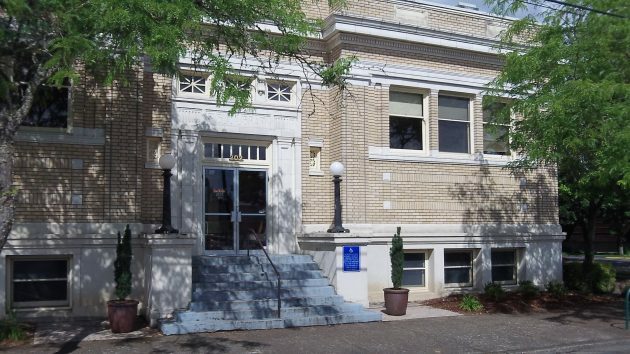 The main Albany library on 14th Avenue S.E is open part of every day, but the so-called Carnegie Library downtown in recent years has been closed Saturdays and Sundays. Now, until around Labor Day, the downtown branch at 302 Ferry St. S.W. will be open to the public its usual hours (10 to 6 Monday through Friday) plus from 10 to 2 on Saturdays. This, the bookmarks told anyone troubling to read them, is being “made possible through funding from the Albany Public Library Foundation.” Spence says the new hours are the foundation’s way of supporting efforts to have more people visiting and spending time downtown. As the bookmarks also pointed out, people might want to combine stops at the Saturday farmers’ market and the library just a couple of blocks away. The downtown branch marked its 100th year in 2014. It’s named for steel magnate Andrew Carnegie, whose donations made possible public libraries all over the country. He gave Albany $12,500, which was matched by local contributions. Today the library offers books, of course, about 23,000 of them, including an ample supply of mysteries and thrillers, but also computer terminals, magazines, a few newspapers, and all kinds resources for research including Albany city directories going back nearly 100 years. The downtown library was closed this Saturday, as usual but this will change next weekend. Excellent news! I have asked that the Carnegie be opened on weekends for years. I’m so happy that the Albany Library Foundation found a way to make it happen. I’ll be visiting the Carnegie on Saturdays this summer and I invite my fellow Albanites to join me. We need more citizens downtown to make it alive and energized. Thanks for sharing the news, Hasso.